May the Schwartz Be With You: The Schwartz's vs the most Awesome thing EVER! Ok, so Sarah's a month old and I still haven't blogged about her birth. I'm workin' on it people! Our family became INFINITELY more AWESOME on December 22nd. Sarah is the perfect blend of Chris and my personalities. She's very calm and laid back like her dad. And yet still demonstrates Type-A traits like her mom. For example, on the 21st we went to the our 40 week check up and the doctor did not think Sarah was going to come on her own so we went over the induction plans for the 31st. But Sarah didn't need an induction. She just needed it to be her due date. So on the 22nd at about 2:30 in the morning she started the process to make her grand entrance. I'm proud of Chris and I; we stuck to what we set out to do. We stayed home until contractions were 5 min apart and didn't freak out. I actually didn't wake Chris up until about 4:30 when I finally figured out they were real contractions. His reaction was to start a load of laundry. He also asked me if I wanted to play Wii MarioKart. We had a really easy labor (as far as labor goes). We were admitted officially around 9:45 and had Sarah at 2:22 pm. (sans epidural!) I'm most impressed that I was nice during the whole process. I never yelled or said anything rude to anyone. I never asked for the epidural. 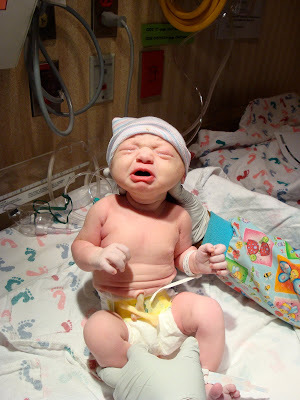 However, I did turn to the nurse at one point and say "I choose C-section", she laughed because it was almost time to push; we were just waiting on the dr. The only thing I'll change for next time is I'm banning the cell phone. It seems at ever contraction I was having to call Chris back over to me from him text messaging family and friends. Thanks for this post! I love a good birth story :) Major brownie points for going natural! How'd you do it?! I'm glad all went well without any complications and that it was a fast and easy delivery (do those really exist)? The most awesome thing ever is absolutely gorgeous and she's so blessed to have you as a mom. You have such a special and beautiful family. Enjoy it!